Join ITE Northeastern District for their Annual Meeting scheduled for May 14th through 16th at the Ocean Place Resort & Spa in Long Branch on the Jersey Shore. 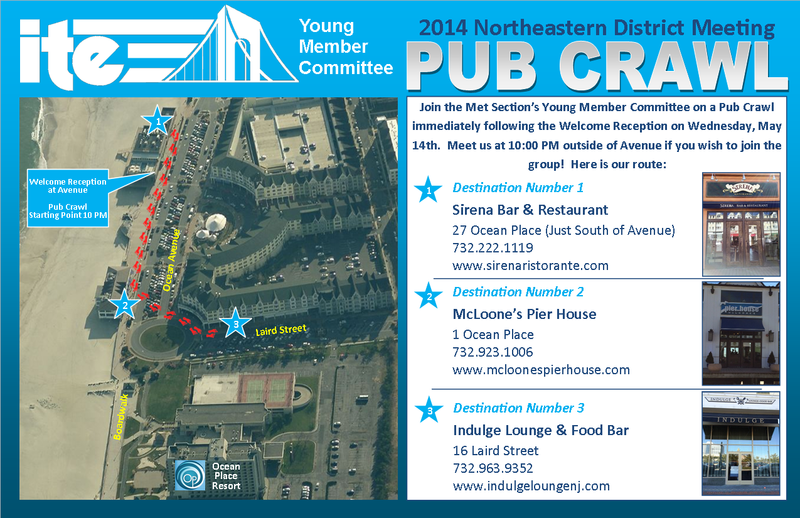 On Wednesday, May 14th the Young Member’s Committee is hosting a free pub crawl open to YPT members and friends. The event begins after the Welcome Reception at 10:00 PM outside of Avenue. – Ample opportunity for continuing education credits – we’ll be offering over 40 presentations segregated into 15 distinct technical sessions, all of which are PDH accredited. – A vibrant social program – whether it be a round of golf at the Old Orchard Country Club,Wednesday night’s welcome reception at one of Long Branch’s hottest nightspots, or Thursdaynight’s beach barbeque and bonfire, there will be plenty of down time to enjoy the beachfront surroundings. – An informative technical workshop – join Dennis Motiani, the Assistant Commissioner of Transportation Systems Management at the NJDOT for a comprehensive discussion regarding New Jersey Statewide Traffic Incident Management and ITS, followed by a tour of the New Jersey Statewide Traffic Management Center to see real world deployment of such infrastructure. – An interactive bicycle tour – take a casual ride through Long Branch and Asbury Park, stopping along the way to view beach restoration efforts and other capital enhancements initiated in the aftermath of Hurricane Sandy.